Summer isn’t quite summer unless there’s fresh sweet corn. Yet sometimes that buttered cob can be a bit too routine, too predictable. So say hello to my fresh corn chowder. Browned butter and Angostura bitters add a distinctive flavor that gives this soup a melt-in-your-mouth deliciousness. I made this with white corn that was available both at my local farmers market and grocery stores. 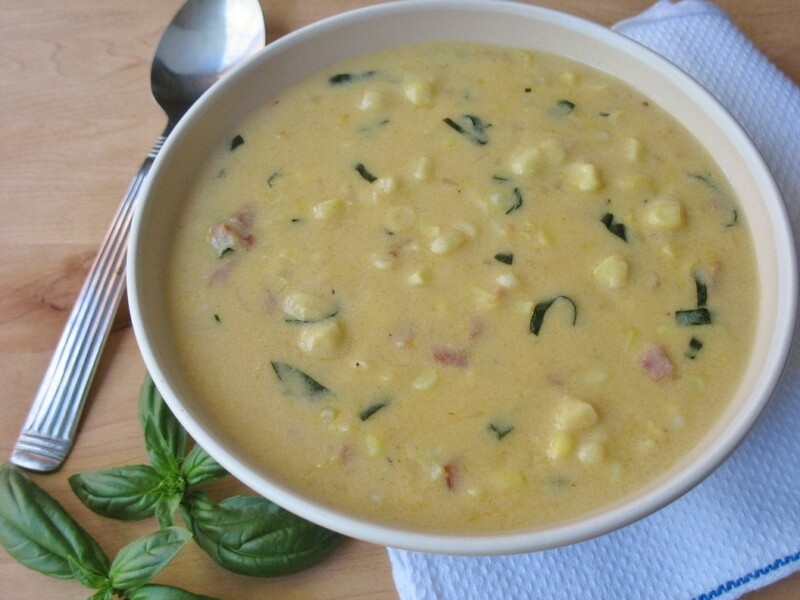 Since September is approaching, give this soup a try now before crunchy sweet corn fades into autumn. And let me know what you think! Shuck the corn, removing silk. Cut off stem to make a flat end. Stand corn on end and use a sharp knife to cut kernels from cobs. Measure 4 cups kernels; set aside. Stir together broth, milk and Angostura bitters; set aside. In a 6-quart pot, melt butter over medium-low heat. Allow butter to bubble gently, stirring occasionally, until butter is light to medium brown. Add onions; stir and cook 3-4 minutes or until onions just start to brown. Stir in ham and continue to cook about 2 minutes more. Sprinkle in flour and gradually add milk mixture, stirring and scraping bottom of pot. Bring to a gentle boil over medium heat, stirring occasionally. Stir in corn, and black pepper to taste. Partially cover pot and simmer 15 minutes. Remove chowder from heat; stir in cheese and basil. – Substitute chicken broth if you prefer. – Corn kernels do not have to be separated once off the cob. That will happen naturally while cooking. – Chiffonade is thin strips or shreds. To prepare, stack large basil leaves one on top of the other, roll up and cut across into strips, then cut strips in half. Or simply chop the basil. – Make soup a day ahead and refrigerate. Heat up when ready to serve. I tried this terrific recipe as Rita was developing it. A winner! Thanks, Rodger. You have a good palate.